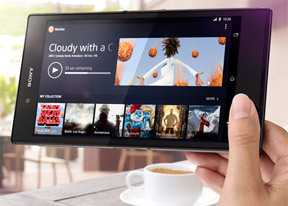 Sony Xperia Z Ultra is the first device running on the Qualcomm's latest and greatest Snapdragon 800 chipset we meet. It is powered by a quad-core 2.2GHz Krait 400 processor, an Adreno 330 graphics and has 2GB of RAM. The Xperia Z Ultra, like the most flagships out there, is packing a 1080p display, so we can easily compare the performance of the new chipset to the old generation processors. The Krait 800 processor clocked at 2.2GHz is currently the fastest processor on the market. We start with a single-core test and we were treated to quite the result. The Xperia Z Ultra had absolutely no problem topping our BenchmarkPi tests chart. Next, we are put all four cores to a test with the multi-core version of the Linpack benchmark. Sony Xperia Z Ultra didn't disappoint, easily beating the Snapdragon 600 competition here. GeekBench 2 benchmark has been recently replaced by the new GeekBench 3 benchmark, so we've run it on all devices we had around at the moment. Sony Xperia Z Ultra is the champ in this chart as well outrunning the Galaxy S4 and the HTC One by a mile. Quadrant and AnTuTu evaluate the overall device performance instead of just the CPU, but the Sony Xperia Z Ultra and its Snapdragon 800 chipset shine again. It's time to test the new Adreno 330 graphic processing unit. We ran both of the GLBenchmark tests in offscreen mode, testing raw GPU power. The Xperia Z Ultra easily outpaced all other phones we've tested so far. By the way, the Adreno 330 GPU on the Xperia Z Ultra supports OpenGL ES 3.0, which was recently added to Android (with 4.3) that promised even more impressive graphics. It's reasonable to expect even better performance once Android 4.3 makes its way to this device. The Epic Citadel benchmarks was also updated recently with new Ultra High Quality setting. We've rerun every 1080p device we had around and, as we expected, the Xperia Z Ultra stole the first place once again. The combined BrowserMark 2 benchmark saw another great score from the Sony Xperia Z Ultra, but this time it didn't manage to come on top. The Sony Xperia Z Ultra came back to its rightful top place in the Vellamo benchmark, making the BrowserMark 2's third place much easier to swallow. The Sony Xperia Z Ultra is currently the fastest smartphone (phablets included) on the market right now. There's a noticeable performance lead over the Snapdragon 600 competitors and you can even feel the snappier chipset everywhere inside the Android OS running on the Xperia Z Ultra. Once you get your hands on the Z Ultra you immediately realize that there's some serious firepower under the hood.